Our selection process is designed to test your potential to complete our intensive two-year programme and be successful in social work and beyond. The application process is made up of six stages. You will begin with a self-selection activity that gives you further insight into social work and the opportunity to test your instincts for the profession. This may help to confirm your interest in children’s social work, or indicate that social work may not be the best fit for you. To get started you will need to register some basic details so that we can send you a login via email to access the application form. Our leadership development programme application form consists of two competency-based questions and additional details from your CV. We are looking for you to demonstrate your commitment to the Frontline mission and programme as well as your experience of working well with people. Once you have submitted the form, you will immediately be sent the online test. Verbal and situational judgement test: We ask applicants to complete a combined verbal reasoning and situational judgment test. We are looking for you to demonstrate your ability to use logic and understand information to solve complex problems. We are also assessing how you would handle situations you might encounter as a social worker. You will be presented with some social work scenarios and asked to select the response you feel is most appropriate. We will then view your test results and, if you have met the minimum standards, we will review your application form. Following a successful review, you will be invited to complete a short video interview. Having successfully passed the previous application stages you will be emailed a video interview link. This stage gives you a further opportunity to demonstrate your motivation, leadership and ability to work well with people. You will not speak with anyone directly; you will answer pre-recorded questions from the comfort of your own home at a time that suits you. You have seven days to complete this interview and it should take around 15 – 20 minutes. Please note that you are more than welcome to practise with the software beforehand. If you pass our interview stage you will be invited to attend our assessment centre.These half-day (morning or afternoon) assessment centres will run from September – January. You will be assessed in five different activities throughout the day including a written exercise, a conversation with a care-experienced young person, a group activity, a role play and an interview. Click here to find out more. It can take up to 10 weeks from application to get a conditional offer. We recruit on a rolling basis. 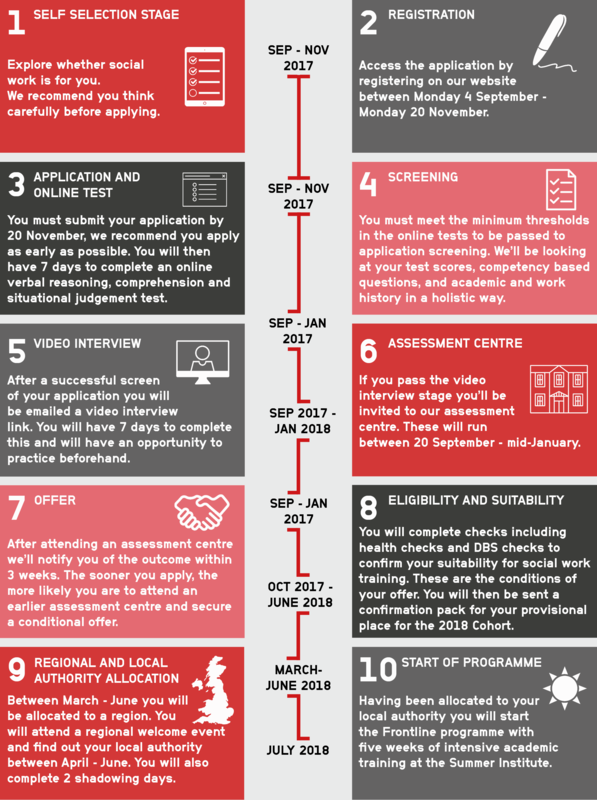 This means that the sooner you submit your application, the sooner you will be able to access an earlier assessment centre and be offered a conditional place on the 2018 Cohort. For more information, please explore our competencies and requirements pages, our advice and guidance or see our FAQs .